Little Miss Autumn is potty trained! Well, for the most part… Autumn wears undies in the morning, on her way to Grandma’s, at Grandma’s, during her nap, for the remainder of the day at Grandma’s, on the way home to my house and till bed time!!! She goes to the potty ALL by herself now, even if she is playing outside she will come inside and use the potty. She is even starting to go #2 on the potty, but I will admit that she still does have a few #2 accidents a week still which IS NOT FUN. She is still sleeping in her crib, but I hope to transition her to a big girl bed in the next month. I need to buy a mattress for her and twin bed sheets/comforter. BTW, she is also using the BIG potty. 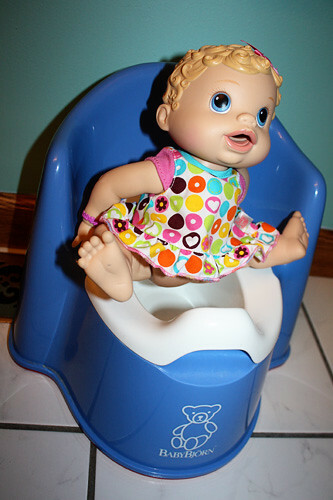 She sits her baby doll down on the potty chair, and then she gets herself up on the big potty all by herself and goes! I mean, how impressive! Girls ARE EASIER!!!!! They really are!